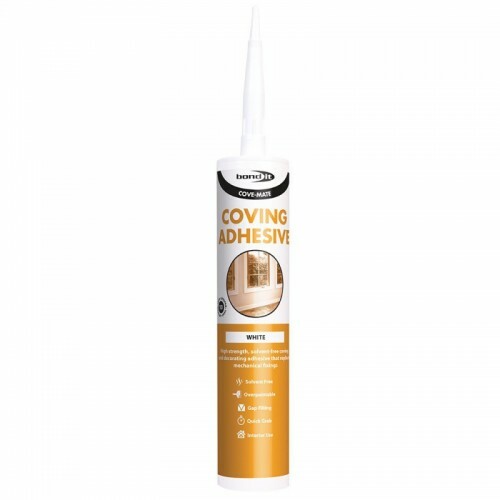 A high strength, solvent-free, gap-filling, coving and decorating adhesive. Quick grab and suitable for interior coving and decorative mouldings. Can replace mechanical fixings in a multitude of home improvement applications. Dries to a white finish and can be over-painted once dry. Ideal for fixing polystyrene and PU covings, skirting boards, architraves and dado rails, etc. It can be used internally on plaster, brick and stone. It is also suitable for bonding work tops to base units and for bonding cork tiles and cork sheet. Note: Not suitable for polythene, polypropylene, teflon, nylon or plaster coving.